On Sept. 13, Parker Solar Probe’s first-of-its-kind water-cooled Solar Array Cooling System (or SACS) was made fully operational. The SACS will protect Parker Solar Probe’s solar arrays — responsible for powering the spacecraft — from the intense heat of the Sun. Though the solar arrays rely on the Sun’s energy to create electrical power for the spacecraft, they’re also very sensitive to overheating, and Parker Solar Probe is the first scientific mission to use a water-cooled solar array thermal management system. Water flows through mini-channels embedded in the solar arrays to absorb heat, then flows into four radiators to release that heat into space. This keeps the solar panels cool while near the Sun, allowing them to efficiently generate power for the spacecraft. 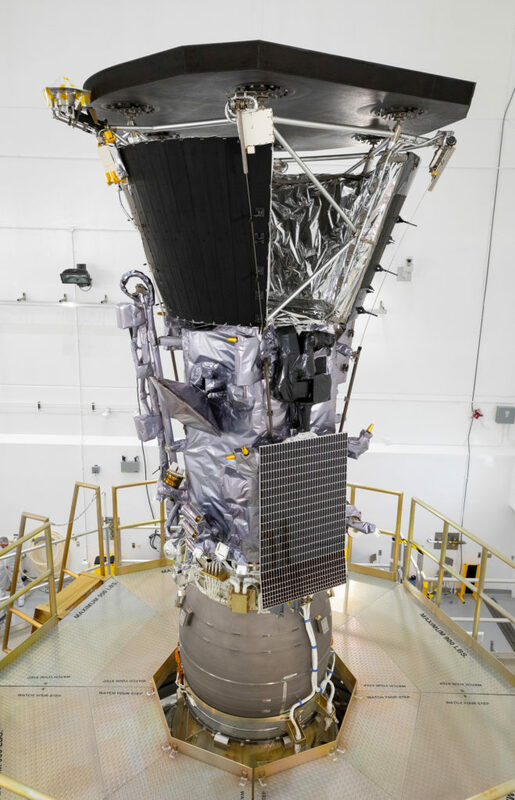 Though the Sun-facing side of Parker Solar Probe’s heat shield will reach temperatures as high as 2,500 degrees Fahrenheit when the spacecraft is close to the Sun, the SACS will keep the solar arrays — partially exposed to the Sun’s direct radiation — at less than 302 degrees. As planned, the cooling system came partially online shortly after launch on Aug. 12. Roughly one hour after Parker Solar Probe’s 3:31 a.m. EDT launch, the spacecraft autonomously released the launch locks on its two solar arrays and deployed the panels. The spacecraft then released approximately two-thirds of a gallon of deionized water from a heated tank into two of four large radiators, mounted just below the spacecraft’s heat shield. Then on Sept. 13, at around 11 p.m. EDT — when the spacecraft had reached a distance of about 84 million miles (135 million kilometers) from the Sun — the remaining one-third of a gallon of water was released, activating the last two radiators and making the SACS fully operational. These events were controlled by the mission operations team at the Johns Hopkins Applied Physics Lab in Laurel, Maryland. As of 12 p.m. EDT on Sept. 14, Parker Solar Probe was 21 million miles (34 million km) from Earth, traveling at about 51,000 miles per hour (82,000 kph). Track the spacecraft’s progress online.